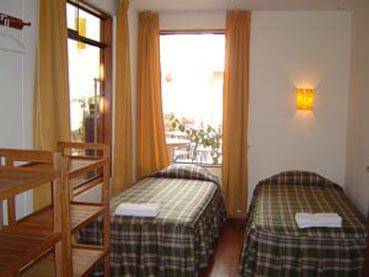 Quechua Hostel, located in the Historic heart of Cusco. Only 450 meters of the Plaza Mayor and to 50 meters of the railway station for the Fortress of Machupicchu and Ollantaytambo in the environment of the Central Market Plazuela San Pedro. Quechua Hostel, just newly builded and finished is an equivalent Hostel 3 stars. We offer a good service to all our visitors with all the installations and comforts that you require. Besides of all we offer tranquility and security, safety. Your lodge will be pleasant and you will be very rested. Quechua Hostel, has 14 rooms among single, double, triple and family. All with private bathroom, low rates that are adjusted to your economy and comfort. Besides we offer services like free parking, laundry service, safe luggage store, tv cable, internet, phone, fax, permanent hot water, also we can pick you up from the Cusco Airport. Feel free to contact us. Orlando Ochoa Rodriguez Administrator, have a feeling of cordial welcome to the Cusco Perú City; and also to this service, hoping that his visit become of his total pleasure and enjoyment of all the wonders that this city offers it disposed to serve it and to attend it while you are in this city thanks. Pick up and transfer to the Airport. Parking (CARS, MOTORCYCLES, 4X4, BICYCLES). Print Service and Photograph Download. Free baggage storage 2 days. Independents Tourist Information (No connection with any agency). Hottest water of Cusco all day! Groups above the 8 people get a 15,- USD rate, We accept ISIC card, 20% discount. Mrs Emperatriz Carpio Administrator, have a feeling of cordial welcome to the Cusco Perú City; and also to our service, hoping that your visit become total pleasure and enjoyment of all the wonders that this city offers you while you are in this city. See our site for the location. We can pick up from the airport. We are just one square from the railstation, and 10 minutes from the main bus terminal.